Unmanned aerial vehicle (UAV) of Lebanese extremist organization Hezbollah intruded into Israeli airspace on November 7, 2004 approximately at 10:30 am local time. It flew at a low altitude over a town of Nahariya, turned to the Mediterranean Sea, turned again to the north and fell down at sea near the Lebanese shore (see Figure 1). According to information published in press, the UAV spent nearly half an hour over territory of Israel. As analysis of technical capabilities shows, UAVs can become a very attractive option for terrorists anxious to deliver a covert attack with the use of chemical or biological weapons. Even armed with conventional explosives, UAV can become more efficient than so-called "shaheed's belt" frequently used by suicide terrorists. A substantial damage can be inflicted, in particular, if a UAV is directed to a crowded place. 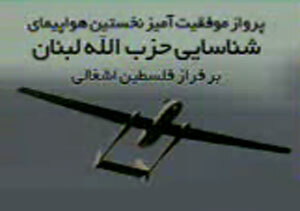 In addition, UAVs can penetrate to the areas, where suicide terrorists have almost no chance to get to. Meanwhile, terrorists do not even try to hide their intentions with respect to the use of UAV as a bomb delivery means, stirring up fears in the Israeli media. As Hezbollah leader Sheik Hassan Nasrallah said after the incident, "Mirsad 1" type UAV flights will continue, such a drone "can be laden with a quantity of explosives, 40 to 50 kilograms" and reach "anywhere, deep, deep" into Israel. Can this statement be not just a bluff? Unfortunately, data on "Mirsad 1" UAV that can be found in news reports are too scrappy and contradictory to draw unequivocal and definite conclusions. Hezbollah released a 20 second footage of the drone, but it is impossible even to estimate the size of the UAV from the frames published (see Figure 2). According to Israeli sources, "Mirsad 1" is an Iranian "Mheger 4" drone,2 powered by a 10 hp engine and capable to fly at 2 km altitude with a maximum speed of 120 km/hr. According to the same source, Iran supplied Hezbollah with 8 such drones, and over the past two years some 30 Lebanese operatives have undergone training at Revolutionary Guards' bases near Isfahan to fly similar aircraft. Israeli press also reported that the wingspan of "Mirsad 1" UAV is about 3 m, and its fuselage length is 2.9 m.
One may also make an attempt to estimate the speed of "Mirsad 1" from the information published in newspapers. According to a statement of Hezbollah leader, the flight over Israel to Nahariya lasted 14 minutes. Israeli side confirms this claim. In particular, the army said the plane flew for about 15 minutes along Israel's northern Mediterranean coast until it reached Nahariya. The town is located near 9 km from the border with Lebanon (see Figure 1). Thus, if the flight pass was straight, the speed of the drone did not exceed 40 km/hr. This conclusion puts in doubt reliability of the information published, unless there was a strong head wind. The fact is that such a slow cruising speed is not typical for a UAV with the technical specifications claimed. The speed estimated is slower than vehicle's stall speed, which is unlikely to be less than 80-90 km/hr for the type of UAVs under consideration. However, at a head wind, say, of 20 m/s (72 km/hr), the UAV speed relative to the air flow becomes nearly 110 km/hr, which can be true. One may notice from comparison of the published information with specifications of known UAVs, that the size and engine power of "Mirsad 1" look similar to those of "KhAI-112" remotely piloted vehicle designed by Ukrainian Physical Simulation Research Institute (see the Table 1). A payload of "KhAI-112" UAV does not exceed 15 kg, while its maximum take-off weight is 60 kg. A notable difference in maximum speed of these drones may mean that "Mirsad 1" is heavier than "KhAI-112", but its take-off weight unlikely exceeds 80 kg. As estimates show, usually maximum weight of a payload cannot exceed half of UAV take-off weight, if the latter is less than 200 kg. Thus, one may conclude that "Mirsad 1" can carry a payload of no more than 40 kg. 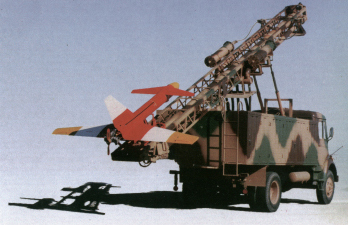 Some analysts assume, that Hezbollah used an "Ababil" type UAV produced by Iran Aircraft Manufacturing Industries (HESA). "Ababil" UAV is a canard configuration and similar in size to "Mheger 4": wing span - 3,25 m, fuselage length - 2,9 m. It is launched by a pneumatic launcher or by a rocket, and uses a parachute to land. 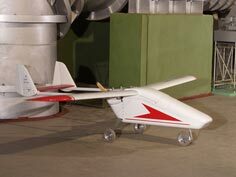 "Ababil" can fly in an autopilot mode, however its operator can also guide the UAV remotely from the ground. The drone has a more powerful (25 hp) engine than "Mheger 4", and according to the manufacturer, it can fly with a cruising speed of 165 knots (about 300 km/hr). As one may see from the table, "Ababil" can carry a 40 kg payload, which is close to that claimed by the Hezbollah leader. Interestingly, size and engine power specifications of "Ababil" are similar to those of "Pchela" reconnaissance UAV that is used by the Russian Army (see Table 1). Most likely, cruising speed of "Ababil" claimed by the manufacturer is an exaggeration and, in fact, it does not exceed 150-200 km/hr. For comparison, "Pchela"'s cruising speed is 140 km/hr. The second part of the Hezbollah leader's statement - a maximum range of the UAV - is also worth a discussion. 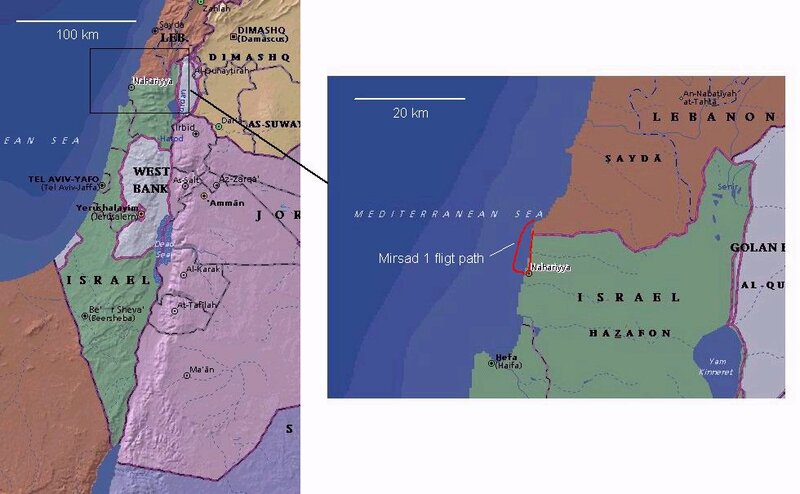 One may conclude from analysis of published information, that the flight path of "Mirsad-1" starting from intrusion to Israeli airspace to the place, where the plane fell down, was unlikely longer than 30 km. If, as Israeli press assumes, the UAV conducted a reconnaissance mission and was transmitting the obtained information to its ground-based control station, then the operational range was most likely limited by power of on-board or ground transmitter. As a rule, this factor is a major restriction for maximum range of reconnaissance UAVs. In particular, "Ababil" is designed to operate within a radius of 30 km, however its operational range can be increased to 120 km by use of more powerful transmitter. 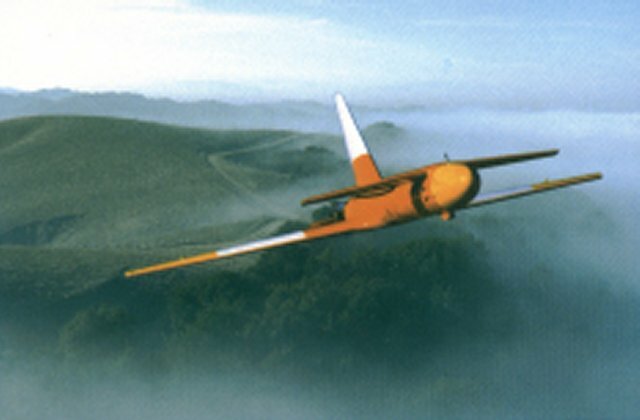 If a UAV is supposed to carry a weapon and to be capable flying in autonomous mode, the maximum range of such a drone is limited by the amount of on-board fuel only. Assessments for propeller driven reconnaissance UAVs with piston engines show that the fraction of spent fuel weight relative to take-off weight may be as low as 3-4% per hour in an economic flight regime. A UAV has to have a range at least 400 km in order to attack targets in southern part of Israel, located at the longest distance from the Lebanese border. Taking into account the fact that the flight path may not be a straight line in order to ensure covertness of the attack, its length may be as large as 600 km. 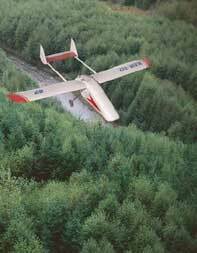 If a cruising speed of the UAV is about 120 km/hr, and this speed is close to economical one, the weight of fuel required for flying that distance is about 15-20% of the take-off weight, provided that the wind speed is negligible. Specifications of a UAV allow having such amount of fuel on-board, as it was shown above. However, that can be only done at the expense of payload, so that the latter most likely will not exceed 30-35% of the take-off weight. Increasing the speed of UAV in order to reduce probability of its detection from the ground will lead to increase of fuel consumption required to fly the same distance. According to rough estimates by the author, fuel consumption will increase as the UAV speed squared. Currently no country has an efficient defense against small low-flying UAVs, because existing air defense systems are not designed to counter threats of this type. Air defenses are mainly aimed at relatively large and fast planes. Thus, it is not surprising that Israeli air defense turned out to be weak against "Mirsad 1" UAV. Israeli army could also do nothing to shut down the plane though they observed the entire flight over their territory. 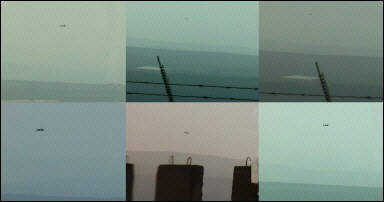 Assessing capabilities to detect the UAV by an observer on the ground, one may assume that in favorable weather a naked eye can see it at a maximum distance of 3 km (estimates made for "Pchela" UAV). Besides that, "Mirsad 1" was quite noisy, according to press reports. Maximum distance at which an observer can hear "Pchela" is also about 3 km. Finally, one may conclude that, if the claim of Hezbollah leader is an exaggeration, it is not a big one, provided that this extremist group did obtain "Mheger 4" or "Ababil" type UAVs with technical specifications discussed above. Nevertheless, Sheik Hassan Nasrallah denies any possible connection with Iran and insists that Hezbollah develops unmanned vehicles on their own. Possibly, this statement reflects his intent not to expose Iran to an additional pressure from international community, even though Hezbollah drones are of Iran's origin indeed. However, the leader of extremists may well have told the truth. As a technical analysis shows, a small group of air model fans (or even a someone alone) can build a capable UAV. All necessary equipment and parts are available in the open market at affordable prices. 1) It is known, that in 1987 a Palestinian guerrilla sailed over on a hang glider and killed six soldiers of Israeli Army before being shot dead. 2) Most likely, the Iranian UAV is the same as "Mohajer 4", which was reported of earlier by news sources. See, in particular,: Iran: Chemical Weapons Guide, 2002-2004, Nuclear Threat Initiative, updated September 2004.